Cut 8 slices (pork rounds), each 1 and 1/2 inches thick, from the center of the pair of pork tenderloins. Refrigerate or freeze the ends for another use. Place pork rounds on the foil-covered broiler pan. Sprinkle with salt and pepper. Set aside a few minutes while broiler heats. Meanwhile, heat 1/2 cup water to boiling in a medium nonstick pan. Slice cored apples from top to bottom in 1/4-inch wide pieces.Add apples, raisins, walnuts, and cinnamon to boiling water. Reduce heat to medium. Cover. Simmer, stirring occasionally, until apples are soft and easily pierced with a fork. Set aside until pork is cooked. 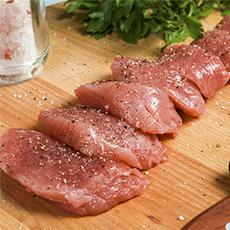 Broil pork tenderloins for 5–10 minutes per side (for a minimum internal temperature of 160 °F). To serve, place two pork rounds on each dinner plate. Top with one-fourth of the applesauce.